Defence Minister Christopher Pyne and Minister for Finance and the Public Service Mathias Cormann have officially launched the construction of Australia’s first new warship since the Hobart Class at Osborne Shipyard in Adelaide. "Named for the Arafura Sea, the name recognises the prominence of Navy’s enduring operations in the northern approaches to Australia to protect our national interests, natural resources and maritime borders," Minister Pyne said. 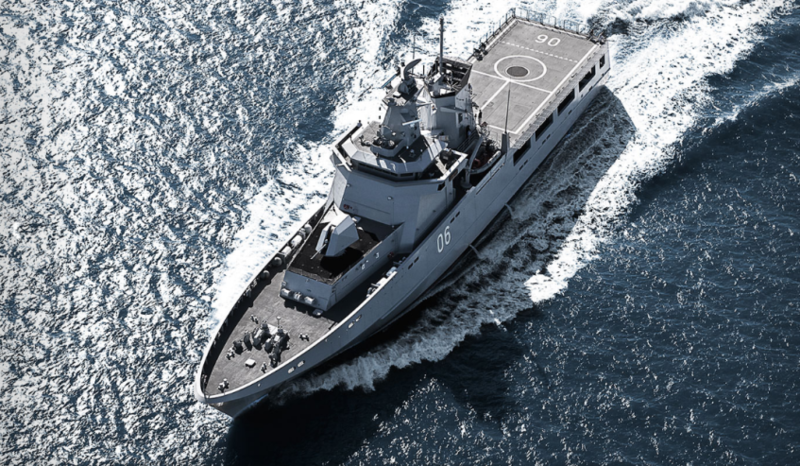 Minister Pyne said, "The OPV project is expected to create up to 1,000 direct and indirect jobs. These new vessels are being built in Australian facilities, with Australian steel, and by Australian workers." The beginning of construction marks a major milestone in the government’s $90 billion, continuous naval shipbuilding program, which is the largest and most ambitious capital investment ever undertaken in Australia. "This investment is about more than building ships, submarines and shipyards because it will establish an Australian sovereign capability," Minister Pyne said. The OPVs will be built using Australian steel, creating Australian jobs. The steel used today in construction is from the same batch cut by the Prime Minister in Henderson just a few weeks ago. Minister Pyne said ASC Shipbuilding will use its expertise gained through the Air Warfare Destroyer program to build the first two OPVs. Luerssen Australia Chairman Tim Wagner said it was a great honour to be responsible for the delivery of the SEA1180 program and to be partnering with great companies like ASC, Civmec, Saab Australia, L3, Taylor Bros and Penske. "We are proud to be part of this nation’s shipbuilding capability, and to ensure that German design and technology can be married with the best of Australian manufacturing and ingenuity," Mr Wagner said. Minister Cormann said that ASC’s shipbuilding capacity has continued to grow from strength to strength since the government initiated the Air Warfare Destroyer reform program in 2014. "We have also signed up a number of leading defence suppliers who will become our key sub-contractors, ensuring the benefits from SEA1180 will also flow through to many local small and medium-sized enterprises," Mr Wagner said. ASC Chief Executive Officer and Managing Director Stuart Whiley said Australia’s shipbuilding capability has been built up over the past 10 years on the Air Warfare Destroyer program, which is delivering the Navy’s most potent naval surface vessels. "Today, the highly skilled ASC shipbuilders commence their second surface shipbuilding project and Australia embarks on continuous naval shipbuilding for decades to come," Mr Whiley said. "ASC’s workforce has already delivered two state-of-the-art Air Warfare Destroyers, with a third due next year. They are also exceeding their performance benchmarks in support of our Collins Class submarine fleet," Minister Cormann said. In 2005, ASC was awarded the role of shipbuilder for the Hobart Class Air Warfare Destroyer project. These are the most advanced and complex warships ever built in Australia and are being constructed at ASC's state-of-the-art shipbuilding facility, ASC South, located at Osborne, South Australia. Under the $35 billion SEA 5000 project, ASC will become a subsidiary of BAE Systems to deliver the Hunter Class Guided Missile Frigates to RAN.